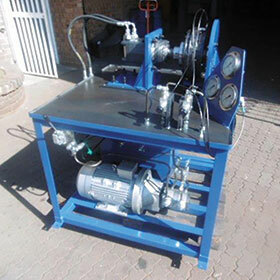 Commercial Shearing is a major supplier of hydraulic equipment and solutions and specialises in custom manufacture, and the supply and service of pumps, motors, valves, gear pumps, hydraulic filters and much more, all covered in its extensive catalogue. The company recently completed an order where the brief was to design and manufacture a hydraulic test stand for spring applied hydraulic brakes with hydraulic release on vehicles. The operation of the brakes is as follows: in park (Failsafe) the brake is applied by springs acting on friction plates. When the vehicle is driven, the brake is released by applying pressure to an internal cylinder. This compresses the springs and releases the force applied to the friction plates, allowing the vehicle to drive. To allow the vehicle to slow down or stop (Service), an opposing pressure is applied to the opposite side of the cylinder. This compresses the friction plates and the vehicle slows or comes to a stop. A maximum static torque of 2 kN/m is applied to the brake in Failsafe mode and the brake must hold. A maximum torque of 3 kN/m is applied to the brake in Service mode when the brake is applied. The torque simulation is applied to the brake by stalling a 800 cc/rev hydraulic motor. The brake is released (Failsafe mode) by applying pressure through an adjustable pressure reducing valve, which allows the motor to run. The brake is applied (Service mode) by applying pressure through an adjustable pressure reducing valve and this stalls the hydraulic motor. Torque figures are recorded via pressure gauges. In a first for South Africa, Tectra Automation and Hytec collaborated to aid a motor vehicle OEM reduce energy costs at its Port Elizabeth engine plant. Hydraulic and Automation Warehouse (HAW) now supplies 700 bar hose, mainly used on hydraulic tooling. New solenoid operated relief valves. Hytec recently commissioned the R10 million hydraulic systems it supplied for the new bulk handling equipment installed at Assmang’s Black Rock Mine Operations in the Northern Cape. Hytec Services Africa has launched mine site-based containerised hose workshops to provide a comprehensive onsite hose and fittings service to its mining customers across Africa. Hyflo offers the local market a comprehensive service for hydraulic systems, which includes the manufacture of hydraulic power units (HPUs) designed to meet exact customer specifications. Hyflo’s extensive range of fluid power products includes hydraulic crimping equipment and tooling, designed for the efficient manufacture of factory quality hose assemblies. A new addition to Axiom Hydraulics’ comprehensive portfolio of hydraulic brands is the Intermot range of radial piston hydraulic motors. Dosco’s unique GPM product range of gear and piston motors and pumps has strengthened its footprint in the marketplace and reinforced its reputation as a highly reputable hydraulics company. Omron has introduced four series of condition monitoring devices to monitor operational status in manufacturing sites for workers.